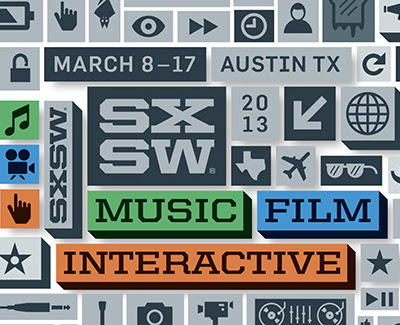 For yet another year SXSW performers have made one of their songs available for free download. And once again the unofficial home of SXSW torrents has collected them and made them available as a bittorrent file. There is just one-shy of a thousand tracks currently available, with more promised. 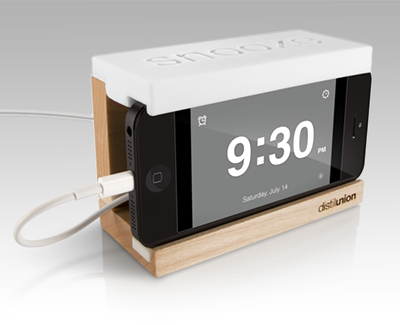 We were tired of fumbling for our iPhone alarm in the morning, so we created Snooze – the bedside stand with a big, functioning snooze bar. It creates a home for your iPhone and cable, so no more knocking your iPhone off of the nightstand or turning your alarm off by accident – the rubber top of Snooze lets you easily quiet your alarm or incoming phone calls. Jeffrey sez, "I spent the last 4 months stitching 48,000 images together into a single panorama which lets you see things up to about 15 miles away. This image is about 4 times larger than the previous world record image, a 114-gigapixel image of Shanghai. 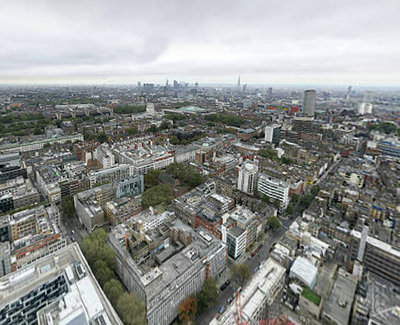 The panorama was shot from the top of BT Tower, using 4 cameras, lenses, and robots for moving the cameras. Three photographers using about $100,000 of gear spent 5 days up there. Stitching was done on two workstations with 192GB and 256GB of RAM, using Kolor Autopano Giga stitching software. Sadly, the software choked on the gigantic dataset, and the stitching work ended up taking about 3 months longer than planned. One great way to save money when buy Apple gear is to go the refurbished route. Unlike some company's refurb items, Apple refurbs are as good as new. But short of checking the Apple website every 10 minutes, how do you know when a refurbished model that you’ve been looking for is on sale? Meet RefurbMe. RefurbMe catalogues all the latest Apple Store refurbs and can notify you when price and/or availability changes. 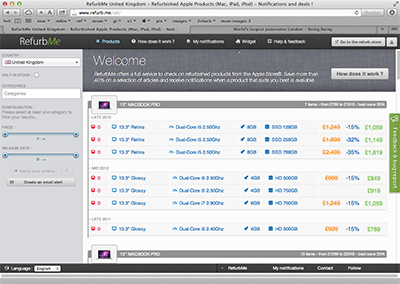 The site lists Mac desktops and laptops, monitors, iPods, iPads, iPhones, and even the Apple TV. You can filter the listings by category or just scroll through a master list. You can filter the results by country, price, release date, and whether or not the products are in stock. Then inside each category, you can filter by additional specs, like capacity and colour, where applicable. If you sign up for a free account, RefurbMe will send you text or email alerts whenever a new product arrives. Set up what you want to be alerted about, then click 'Create an email alert'. The Pixel, a new Chromebook built and designed by Google is a Chromebook unlike any other — premium hardware, high performance and a high-resolution touchscreen display. It won’t come cheap. Pricing starts at $1,300 (£1049) for a Wi-Fi-only version. Google is making the Pixel available for pre-order Thursday, and it will ship the first week in April. With that charge in mind, the Pixel introduces some new ideas, and a few older ones too. The exterior design is impressive: an austere rectangular block of aluminum with subtly rounded edges. The black, inset, squared keys bring Apple MacBooks to mind. The implementation of a touch display can’t be found on Apple laptops yet, but it’s increasingly common on newer Windows 8 machines. The touchscreen ditches the 16:9 aspect ratio found on most laptops in favor of a 3:2 display that’s more friendly to web browsing. The touchscreen measures 13 inches and rocks a density of 239 pixels per inch, which results in a resolution of 2560 x 1700 pixels for a total of 4.3 million pixels. The screen is gorgeous. Powering all this is an Intel Core i5 CPU with integrated graphics (scrolling on webpages is very smooth) and it has some on-board storage in the form of a solid-state drive — 32GB for the Wi-Fi model. Google is throwing in 1TB of free Google Drive storage space for three years. Pichai said three years is roughly the expected lifetime of the device. Battery life on the Pixel will come in at about five hours. SwiftKey 4 is one of the best gesture keyboard apps ever. It is so good at predicting what you type, it borders on being creepy. I can rattle off e-mails, tweets and text messages to friends about sports, movies, tech, music — and based on what I’ve typed, SwiftKey occasionally finishes sentences word by word. It does this by collecting data on what is typed as it’s typed. The data is collected anonymously, feeding the app’s learning algorithm to predict what you’ll type next, based on what you’ve typed in the past. It’s not perfect, but it always offers suggestions, right above its keyboard. 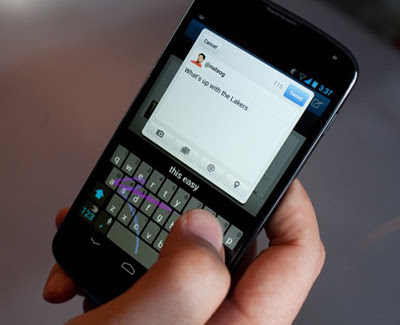 As you’re swiping across your phone’s display, SwiftKey guesses what you’re typing. Those guesses change as you type more letters; when you see the word you want, just lift your finger. Or, keep swiping the letters of that word and then swipe down to the spacebar for a space, then start a new word. If you’re already using SwiftKey, the upgrade to the 4th generation of the app is free. Otherwise, SwiftKey 4 is a $3.99 download. The new HTC One features an entirely aluminium, unibody construction that feels surprisingly light in the hand yet packs a 4.7” screen with a pair of stereo speakers either side of it. The idea is to appeal to users who want to watch films and still hear them properly. That audio comes from Beats, as it has with previous HTC models and in a few short tests it was impressive enough, even if in real life you’re far more likely to use the One with headphones. The 1080p screen offers 468ppi, compared to 306 for the Galaxy S3. Is the difference noticeable? Yes. The 'Zoe' Camera takes a burst of shots around the time you know you want a picture, rather than from when you press the button. The effect is to give you more options and to let you compose a single shot from the best bits of what is actually in several images. HTC claims the sensor (f/2.0) captures 300 per cent more light. In my limited tests it certainly looked impressive, but not immediately amazingly better than excellent rivals such as the Nokia Lumia range. Blinkfeed aggregates your social networks and the news into a single place. This feature means that an entire homescreen of your phone is replaced with a new paradigm, which looks remarkably like Windows Phone. 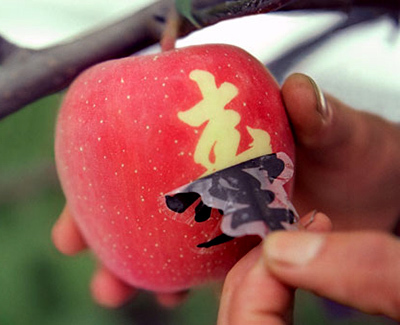 As they are finally exposed to the elements for the final few weeks before harvest, the most perfect apples are then decorated with a sticker that blocks sunlight to stencil an image onto the fruit. This "fruit mark" might be the Japanese kanji for "good health". Others have brand logos (most notably that of Apple, the company). One Japanese pop star put his picture on apples to give his entourage for presents. 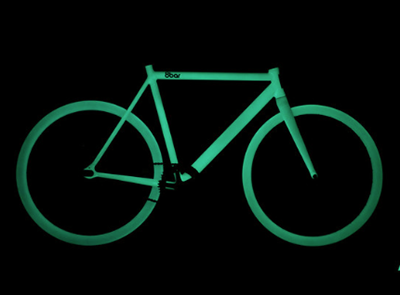 Because of a special surface treatment you can charge your bike with sunlight or artifical light. The strongest effect can be achieved by charging it with UV light. Autodesk's 123D Creature is a $2 iPad app that lets you design a monster and then order a 3D print for home delivery. Add joints and create limbs to build up your 3D character in digital clay. Reposition, pose, and scale limbs; and adjust your creature's shape. Add surface details using the sculpting tools, then use the airbrush to paint on color or use image paint add realistic details by to rubbing areas of a photo onto your 3D creature. Bring your 3D creature into the render room to generate amazing images to share with your friends. Use the in-app printing service to order a 3D print of your creature, or export your 3D model complete with textures. I purchased my first Praktica SLR in the late 1970s. It was as basic as a basic thing, but the images I captured with it made me realise how much I enjoyed the art/discipline of photography. From there I moved through a range of SLR 35mm film cameras, including a Pentax ME Super and a Minolta 700. During that time I also invested in an Olympus XA, one of the first proper 'compact cameras'. It taught me the very old truth that 'the best camera is the one you have with you'. I carried it with me everywhere, on my motorcycle, in my briefcase, and often in my anorak pocket. 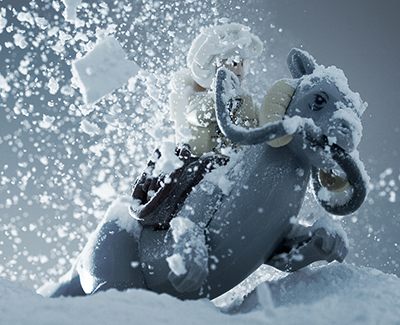 And as a result, many of my favourite images were captured with it. My first adventure in digital photography was with a Ricoh RDC-i700 an 'ahead-of-its-time' 3 megapixel compact, with a zoom lens, and an articulated, touch-enabled viewing screen. My first DSLR was a Sigma SD9. It was big, bulky and slow. But its Foveon processor produced 'film-like' results as long as there was enough light. After that I worked my way through a range of compact digital cameras, moving from Fuji to Panasonic. And then came Micro Four Thirds. 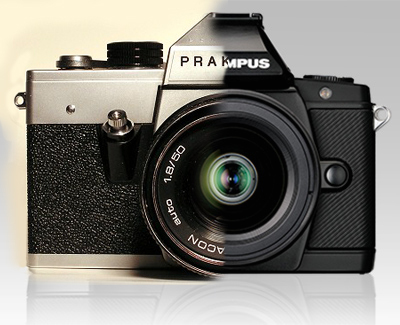 A joint venture by Olympus and Panasonic to produce a 'mirrorless' interchangeable lens format that would combine the portability of digital compacts with the image quality of 'conventional' DSLRs. In June 2009, I purchased a Panasonic G1, complete with a 14-45 and 45-200 zoom lens. It was a revelation, small enough to carry in my backpack, but capable of producing images that compared favourably with DSLRs 3 times its price and bulk. I took thousands of pictures with this camera, and added a couple of 'prime' lenses to my kitbag, the Lumix 20mm f/1.7 and 14mm f/2.5. I dabbled with a RAW workflow, but didn't see big enough quality improvements to stick with it. Panasonic released a number of newer models, and I tried them all, never seeing enough advantages to upgrade. And when the GH3 arrived, it was noticeably bigger than the older models, and very much angled towards video performance, an area I have no interest in at all. And so I decided to take a look at the Olympus OM-D EM-5 (quick plug here for SRS Microsystems in Watford. The staff are helpful, patient and well-informed). My first impressions were not overwhelmingly positive. I'm not a big fan of its 'retro' styling, preferring the ergonomics of the G1, especially its articulating screen (the Olympus only tilts in one plane). However, the OM-D's speed/accuracy of focus is superb. As is the electronic viewfinder. And the 'in body' image stabilising is very attractive as I am not blessed with steady hands. I had seen the quality of images it was capable of producing, so decided to take the plunge. It came with a 12-50mm macro zoom, and a 'voucher' to send off for a free 45mm f/1.8 lens. Since then I have spent a few months with the camera, and am very pleased with it. The initial images were not as good as I hoped, but a quick browse through some online forums encouraged me to shoot RAW. This was a revelation, and I now shoot exclusively in RAW, using Lightroom, Aperture and Photoshop for my post-processing work. Its low-light ability allows me to take very acceptable pictures at ISO 1600, which combined with its superb image stabilising system means that even in quite dimly lit situations, I can take well-exposed, clear pictures. The colour/white balance is very good, even in difficult lighting situations, and skin tones are superb. And the ability to touch the screen on the area you want to focus on is a big improvement over the traditional 'focus, hold shutter button half-way down, recompose shot, take photo'. I do miss the articulated screen, both when using the camera, and for the peace of mind it gives being able to fold it 'face-in' to the camera when it is not in use. And it doesn't fit as well in my hands as the G1. But the OM-D is definitely my new favourite camera. Wired has published a gallery of superb shots. "Ultra Ever Dry" is a nanomaterial spray-coating that (allegedly) sheds dirt, water and oil. The jaw-dropping product video suggests many possibilities, from extreme hydroplaning sports to odd molecular gastronomy possibilities (though it's not rated food-safe). If you're impatient, just zip the video to 2:00 or so and marvel. 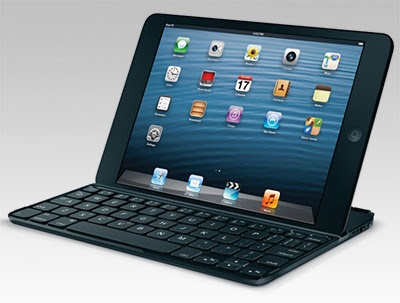 Electronics accessories manufacturer Logitech has launched the Logitech Ultrathin Keyboard mini, a slim protective keyboard and cover built for Apple’s 7.9-inch tablet. It has a solid base, meaning it’s very easy to use it both either a desk or your lap. The cover is built from aluminium, keeping it slim and light, but also durable. It fits onto the iPad mini using a series of integrated magnets, and can be switched on simply by flipping it around to reveal its 'Bluetooth EasyType' keyboard. The keyboard itself uses a traditional typing layout, with sensible space allocated for each key. 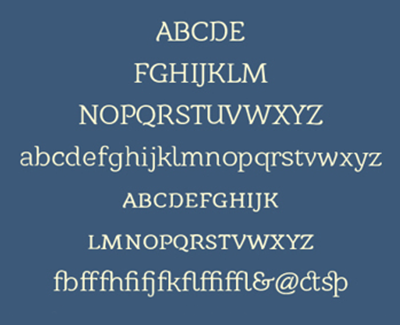 Shortcut buttons can be accessed using the Fn button and a corresponding number key found at the top of the keyboard. As an example, Fn+1 will start a Spotlight search, while Fn+2 opens the Safari Internet browser. 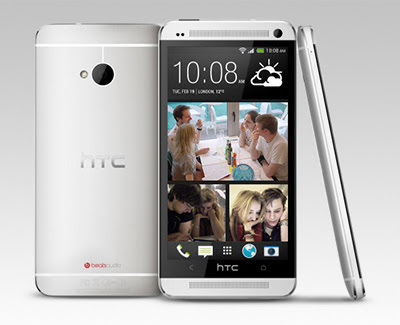 The cover is available in black, white and red, and offers a three-month battery life over a range of up to 10 meters. Logitech says it expects the Ultrathin Keyboard mini to be available in the U.S. and Europe from this month, with a suggested retail price of $79.99. 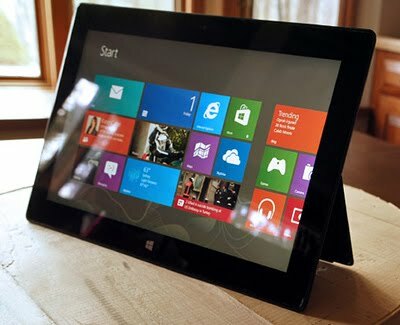 Engadget has published a full review of Microsoft's high-end tablet. "Welcome to the Surface for Windows Pro, which promises all the niceties of the Surface RT - compelling design, build quality, performance - with full support for x86 Windows applications. (That is: every single Windows app released before the end of last year.) And, adding a 1080p display. So, then, is this perfection in a single 10-inch, $899 device?" "The 10.6-inch, 1,920 x 1,080 display looks great, offering very nice contrast and brightness, plus viewing angles that maintain that contrast from just about wherever you can see the display." "By default, the tablet is set to scale text to 150 percent its original size, making most (but not all) menus and buttons huge and reasonably finger-friendly. That's great when you're actually using your fingers, but it results in a lot of wasted space on the display when you're using a mouse. More troublingly, it made the text and icons in many apps appear rather blurry." "This is only a concern if you'll be working in the traditional Windows desktop frequently, something of a problem since compatibility with legacy Windows applications is a huge selling point here. The OS desperately needs a way to quickly toggle between finger-friendly and native scaling of apps." "Every app we threw at the tablet ran like a charm"
"Still, we could never quite get comfortable in this layout. That keyboard slowed us down and its trackpad continued to frustrate. Due to the lack of finger-friendliness in the vast majority of legacy Windows apps, we were frequently reaching for a mouse. Without it, accurately selecting toolbar buttons and controls was often difficult and precisely wielding photo-editing tools was impossible." "While we spent much of our testing with the keyboard attached, to experience the thing as a tablet we popped off the Type Cover. Using IE in this way is quite good, as it's finger-friendly and responsive, and of course in this way you're encouraged to use all the great Windows 8 gestures, which become intuitive enough after only a few minutes of use. Additionally, the on-screen keyboard offers a selection of usable layouts, and the predictive text and autocorrect functionality means you can type reasonably quickly." 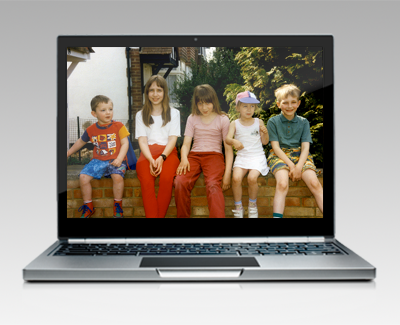 "We physically couldn't get comfortable with the tablet. When laying it flat on a lap it's fine, but we could never find a good way to hold it in a more upright position. At about two pounds, it's definitely on the heavy side, which is one major strike against and that, combined with the angular edges that dig into fleshy parts of hands, means this is not a tablet you'll want to hold for long." "Getting into the tablet takes longer than the Android or iOS competition. Hit the power button and you'll have to wait for about three to four seconds for the display to pop on. Then, assuming you've set a password, you'll have to type that in, and secure passwords are rarely fun on virtual keyboards." "Overall performance of our Intel Core i5 Surface Pro more than met our expectations. A cold boot is completed in eight seconds or less, which is quite impressive indeed, and apps launched snappily and reacted well. Performance here is definitely adequate to get some serious work done." "The back of the tablet did get very warm to the touch and the little fan in here certainly let its presence be known with a somewhat shrill, high-pitched noise. We rarely heard it during less-intensive use, but full-screen video playback was enough to make it kick in." "But while performance was just fine, battery life wasn't. On our standard Windows battery rundown test, in which we fix the display brightness and loop a video endlessly to exhaustion, the Surface Pro scored just three hours and 46 minutes." Dyson has unveiled its latest invention, an update to the Airblade hand dryer. 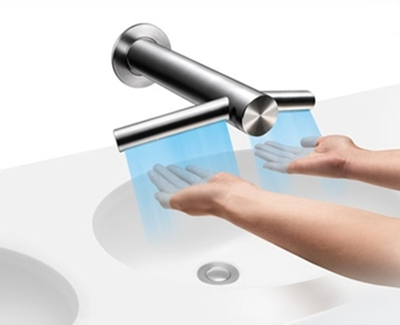 The Airblade Tap takes advantage of some significant size reductions in the technology to integrate drying functionality into the faucet itself. The Tap uses a 1600W motor that can dry hands in about 12 seconds by blasting air out at 420mph. It also cleans the air before blowing it onto your hands. You won't have to touch the Tap, infrared filters sense your hands and send out jets of water and air accordingly. The Airblade Tap should be available March 1st. At £999, you'll certainly be paying for the privilege, but Dyson says the low energy consumption will eventually work out in your favor; the Tap supposedly costs up to 69 percent less to run than a traditional hand dryer, and up to 97 percent less than paper towels. We first looked at bike manufacturer Montague's Paratrooper Tactical Folding Mountain Bike a few years ago, but now the bikes are available for sale to the general public. 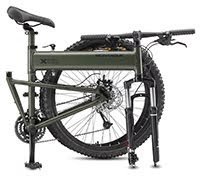 The 2013 24-speed Paratrooper and 27-speed Paratrooper Pro models fold down, without tools, in under 20 seconds. 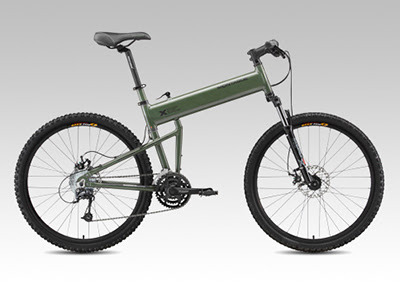 They're also designed for durability — unlike most folding bikes, they don't compromise the crossbar with a hinge. SurfacePad for iPhone is a new breed of protection for iPhone. Feather light and credit card thin, SurfacePad for iPhone adheres to, and wraps around, your iPhone 5 or 4/4S. The luxury leather SurfacePad shields your iPhone from more common hazards, like the keys in your pocket. 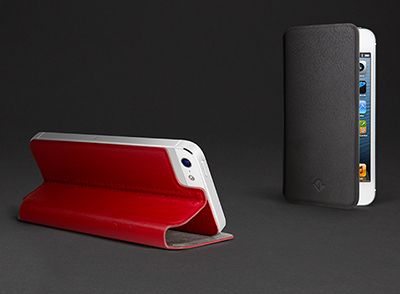 This minimalistic, napa-leather cover also has a built-in stand for hands-free iPhone use. Available in Red Pop, Modern White and Jet Black. Introducing a groundbreaking technique that seamlessly merges computer-generated and hand-drawn animation techniques, first-time director John Kahrs takes the art of animation in a bold new direction with the Oscar-nominated short, 'Paperman'.